With Movienizer you can organize individual movies, movie series (like Star Wars, Terminator, etc.) and TV series. While an individual movie and a movie from a series are much the same (the latter would simply have something in its "Movie series" field), TV series are different. Each TV series contains a set of episodes that may be combined into seasons. Each episode may have its own description and be linked to its own video file. Movienizer handles TV series similar to movies, but there are some differences that we will discuss here. Season. This is the list of all seasons. Seasons are represented by their covers (if available). Episodes. This area contains a list of all episodes for the selected (in the first area) season. 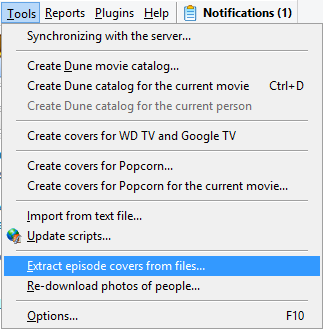 By default, the first season is selected, so episodes of the first seasons are displayed. Episodes are represented as covers (typically its a shot from the episode). Further information includes: season number, episode number, episode title. Information about episode. This area contains information about the currently selected episode (by default, the first episode of the first season is selected). You can view and change such details as episode number, rating, title, description, air date, link to the corresponding video file. Additionally, you can mark episodes as seen. If you add or change a link to a video file in the "Information about episode" area, click the "Reload" button to retrieve and save the updated technical details of the video file into the database. 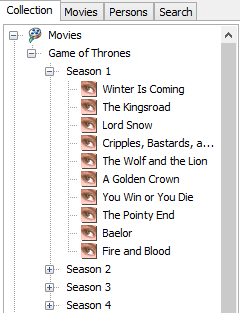 If you added a TV series by title, you can link all episodes to the corresponding video files at once using the "Find files of TV series" button in the 2nd area (right upper corner of the "Seasons" tab). For more information, read this article. Each episode is represented as a separate entity here, which allows saving various properties available on the "Editions" tab for each episode individually. On the "movie page" for a TV series, there is also a "Seasons" tab. It displays a list of all seasons and episodes. 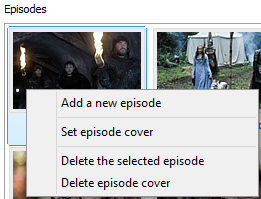 You can click "Yes" to mark all previous episodes as seen, or "No" to mark only the current episode. Here you can control, whether to download information about episodes at all, and whether to download season / episode covers. Some further options may be available in the script settings. The main list of movies can be set up to show or hide TV series, according to its filters.